The 91st annual Academy Awards, aka the Oscars, has been anticipated for nearly a year as 2018 surged with record-breaking box-office premiers, enlightening film festival flicks, and a seemingly new era of diversity in film. For years, the Oscars celebrated and awarded screenwriters, directors, actors, and actresses for excellence in cinematic achievements and makes for one of the highest accolades to be obtained in the film industry. Although, in recent years, the integrity of the voting committee of the academy has been under fire for a lack of inclusion and appreciation for diversity. In 2015, Twitter users created hashtag #OscarsSoWhite. The hashtag poked fun at and spotlighted the overwhelming whiteness of the Academy Award’s list of nominees that year — a reoccurring trend at the Oscars. The lack of representation of people of color in film is outlined in Oscars “snubs” of years past, including 2015 when David Oyelowo — who played Dr. Martin Luther King Jr. in Selma — was left off the nominees’ list for best actor. Instead, actors like Bradley Cooper, Steve Carell, and Michael Keaton (whose film Birdman took home four awards that night) were extensively praised and Spotlight won Best Picture, the top dog in the award hierarchy of cinema. Aside from the several snubbed black-cast and directed films, the voting table of the Oscars seems to ignore an entire genre, that of superhero films. A superhero film has never been nominated for the Best Picture category in spite of brilliant performances, stunning visual aesthetics, and strong direction in films like Captain America: Civil War, Avengers: Infinity War, Wonder Woman, and The Dark Knight, where Heath Ledger’s portrayal of the Joker respectively challenged the legendary actor Jack Nicholson’s take on the psychotic villain. However, the exclusion of superhero films from the long line of past Best Picture winners at the Oscars (including Titanic and Silence of the Lambs) can finally be broken this year. Director Kevin Coogler’s Marvel blockbuster, Black Panther, earned seven nominations from the Academy including Best Picture and was the second highest-grossing film of 2018 (earning $1.35 billion). USA Today’s Brian Truitt backed Academy recognition saying, “the first superhero movie to really deserve an Oscar nod (…) got one.” But after years of impressive film lineups, how did Marvel finally land the Oscars’ attention? Likened to most of the Oscars’ Best Picture winners, the superhero genre has also lacked in the representation of people of color. For years, actors like Chris Hemsworth in Thor, Chris Evans in Captain America, and Robert Downey Jr. in Iron Man led the Marvel Cinematic Universe (and the world of superhero films in extension). Each film included black actors but only as secondary characters like Lieutenant Rhodes (War Machine / Iron Patriot) played by Don Cheadle and Sam Wilson (Falcon) played by Anthony Mackie. Black Panther was a complete game-changer with a majority black cast apart from CIA operative, Everett Ross (Martin Freeman). This progressive step finally created an image of black heroism both in T’Challa (Boseman) and his fierce all-female military. It was paired beautifully with African heritage and the celebration of blackness in music (including original songs by Kendrick Lamar – nominated for Best Song) alongside African cultural traditions. People of South Africa praised the film as a positive representation of the continent despite remarks from U.S. political figures. In addition to its status-quo defying cast, Black Panther artfully crafted strong social commentary in a way no other Marvel movie — or any superhero movie for that matter — ever had before. Through an intense portrayal of black oppression-turned-anger, Marvel created one of their most complex and best villains yet. Killmonger (Michael B. Jordan) is introduced to viewers as a liberator of black oppression, firstly by calling out a British curator for whitesplaining African artwork. Killmonger asks the curator how she thought her ancestors got the artifact saying, “Do you think they paid a fair price? 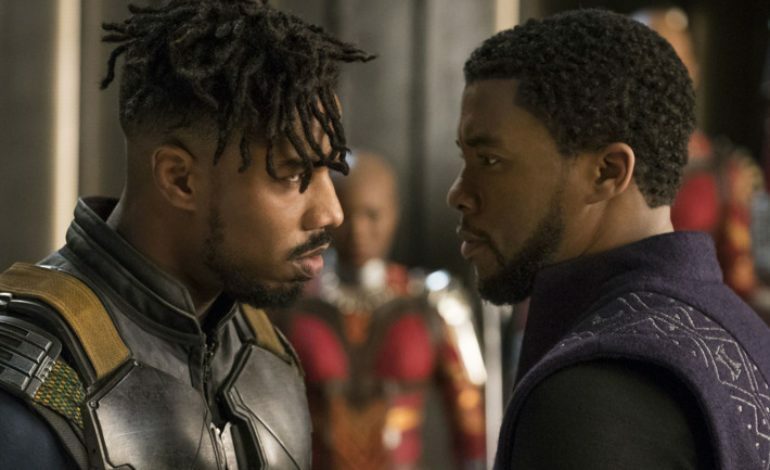 Or do you think they took it, like they took everything else?” He continues to draw much-needed attention to past and present black oppression in the film. Killmonger’s upbringing completely contrasts the life T’Challa (Boseman), now king of Wakanda, lived despite their close familial relation. Killmonger grew up without a father and in the drug-rampant, violent part of Oakland, California. The oppression and constant injustices blacks face in America and in the countries neighboring Wakanda enraged Killmonger who was subsequently misguided into violence, showcased by the branded tallies for each of his kills on his body. Wakanda poses as a third-world country to protect its riches and advanced technology, establishing peace away from the rest of the world. T’Challa never knew systemic racism or the violence that accompanies drug trafficking as Killmonger had. Killmonger pointed out the Wakanda people’s privilege over the average black American and wanted to expose “the truth of Wakanda” to the world by arming the oppressed with vibranium-powered weapons. While Killmonger’s methods were rash, his intentions at times made it hard to identify him as completely villainous like Captain America’s deranged and Nazi-affiliated, Red Skull. Despite Killmonger’s off-course tactics, T’Challa learned about his privilege from him and was inspired to implement a plan to provide aid to those struggling with Wakanda’s advanced resources. With its ground-breaking cast, score, and organic inclusion of thought-provoking social commentary about oppression and aid, Black Panther elegantly bridges heavy themes with a new age of superhero films. Therefore, Black Panther should not only be considered as one of the best superhero movies of the year but simply one of the best movies of the year. The 91st Academy Awards ceremony will be held on February 24, 2019.